Charlotte, N.C. – The Charlotte Touchdown Club is excited to announce 2-time NFL Coach of the Year, BRUCE ARIANS, as one of this year’s luncheon guest speakers. The 2018 Speaker Series Luncheon will be hosted Friday, October 12th at the Sheraton Charlotte Hotel. The event will be hosted in the Sheraton’s grand ballroom from 12:00pm to 1:30pm. An estimated sell-out crowd of more than 750 people is anticipated. (Silent Auction from 11:15am to 11:45am) Proceeds benefit the Touchdown Club Scholarship Fund! ARIZONA: During his first four seasons with the Cardinals, Arians has led the team to a 41-22-1 record. 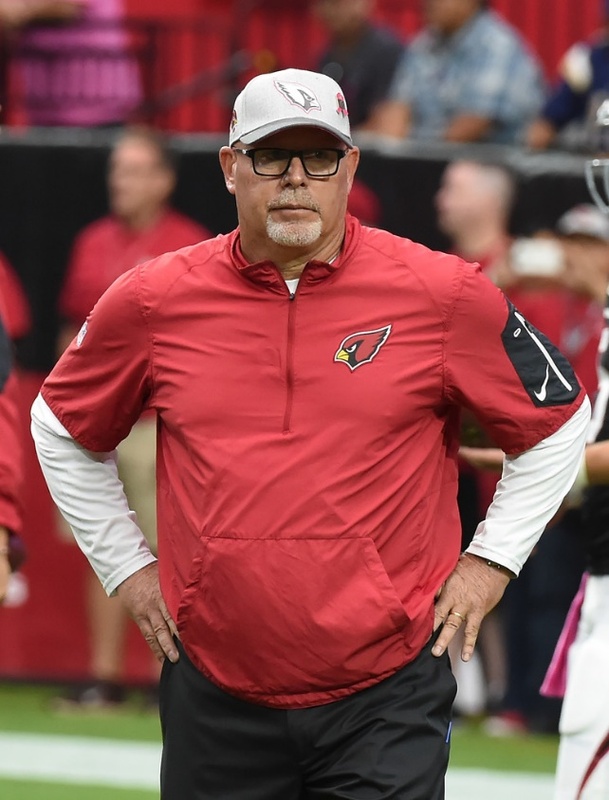 Following a 10-6 campaign during his first season at the helm in 2013, Arians led the team to an 11-5 mark and an appearance in the postseason in 2014 on his way to being named the Associated Press Coach of the Year for the second time in three seasons (Indianapolis, 2012). In 2015 Arians led the Cardinals to a franchise single-season record 13 wins on their way to their first NFC West title since 2009, their first-ever postseason bye and an appearance in the NFC Championship Game. The Cardinals have more wins during Arians’ tenure (41) than they had in any four-year span in franchise history. Only four teams – New England (50), Denver (46), Seattle (45) and Kansas City (43) have more wins than Arizona in the last four seasons. Arians’ 41 wins represent the third-most in franchise history, and he needs just nine wins to pass Ken Whisenhunt (49) for the franchise all-time record. In the last two seasons the Cardinals have posted the #1 (489 in 2015) and #4 (418 in 2016) single-season point totals in franchise history. Arizona has also ranked in the top-10 in both offense and defense in each of the last two seasons, joining New England as the only teams in the NFL to accomplish that feat. In 2015, the Cardinals won their first division title since 2009 after setting a franchise record with 13 wins in the regular season. Arizona secured a first round bye in the postseason for the first time in team history and won the seventh playoff game in franchise history (26-20 vs. Green Bay in the Divisional round) en route to its second ever NFC Championship Game appearance. The Cardinals finished the regular season with the No. 1 ranked offense in the NFL for the first time in franchise history and established franchise single-season records for points (489), TDs (59), total net yards (6,533) and first downs (373). Arizona also established franchise records for road wins (7) and points on the road (262) in 2015. In 2014, the Cardinals tied the then-franchise record for wins in a season (11) and earned the team’s first postseason berth since 2009 despite 21 different players missing a combined 109 games due to injury, including 14 games by QBs Carson Palmer and Drew Stanton. In a sign of the Cardinals resilience under Arians that season, the Cardinals set a franchise record and tied the Pittsburgh Steelers for the NFL lead with nine come-from-behind victories. During his first season with the Cardinals in 2013, the team finished with a 10-6 record after winning seven of its final nine games. Arizona doubled its win total from 2012 and the five-win improvement equaled the best single-season turnaround in team history in a 16-game season. Among all-time Cardinals coaches, only Norm Barry (11 in 1925) had more wins in his first season than Arians. Offensively, the team’s overall league ranking improved from 32nd to 12th while the defense went from 12th to 6th and finished No. 1 against the run. The 1,351 rushing yards allowed were the fewest ever by a Cardinals team in a 16-game season. INDIANAPOLIS: Arians came to AZ after one season with the Colts. In addition to offensive coordinator, he served 12 games as interim head coach while Chuck Pagano was treated for leukemia. Arians was selected as the 2012 AP NFL Coach of the Year after leading the Colts to a 9-3 record and a playoff berth while tying the NFL record for most wins ever by an interim coach. Indy’s nine-win improvement (2-14 to 11-5) matched the third-largest single-season turnaround in NFL history. The Colts went through the 2012 season without consecutive losses and were 9-1 in games decided by one score or less. Arians helped the Colts rank 10th in the NFL (362.4 ypg) in total offense and 7th in passing (258 ypg) and featured rookies that combined for 3,108 yards rushing and receiving, the most of any team since the 1970 AFL-NFL merger according to STATS LLC. The Colts completed 65 passes of 20 yards or more that season, ranking third in the NFL (Detroit-67, New Orleans-66). Rookie QB Andrew Luck, the first overall selection in the 2012 draft, made the Pro Bowl and set NFL rookie single-season records for the most passing yards (4,374), most attempts (627) and 300-yard passing games (six). He also set the NFL single-game rookie record for most passing yards (433, 11/4 vs. Miami). Luck finished third on the NFL’s rookie list for TD passes (23) and set the franchise record for rushing TDs by a quarterback (five). His passer rating of 76.5 also was a franchise rookie record. He led the Colts on seven game-winning drives in the fourth quarter or OT, the most by a rookie QB since the 1970 merger. PITTSBURGH: Prior to Indy, Arians spent eight seasons with the Steelers, five as offensive coordinator (2007-2011) and three as wide receivers coach (2004-2006). During his tenure as offensive coordinator, the Steelers had a 55-25 record, tying the Packers for the second-best mark in the NFL in that span. Pittsburgh won three AFC North Division titles, two AFC Championships and earned a victory in Super Bowl XLIII over the Cardinals. Arians was also part of the Steelers Super Bowl XL win as the team’s wide receivers coach. Arians was instrumental in the development of Steelers quarterback Ben Roethlisberger, helping him become the second-youngest quarterback to win two Super Bowls (26 years, 336 days). In 2007, Roethlisberger was selected to his first Pro Bowl and broke Terry Bradshaw’s team record for touchdown passes in a season (32). Roethlisberger also finished that season with a team-record passer rating of 104.1. In 2009, the Steelers offense became the first in team history to boast a 4,000-yard passer (Roethlisberger), two 1,000-yard receivers (Santonio Holmes, Hines Ward) and a 1,000-yard rusher (Rashard Mendenhall) in the same season. The team also broke franchise records for passing first downs (210) and passes completed (351). Arians also helped Ward develop into one of the top receivers in the game. In his eight seasons with Arians, Ward was selected to the 2004 Pro Bowl and was named Super Bowl XL MVP after finishing with 123 receiving yards and a touchdown. Ward also became the Steelers all-time leader in receptions, receiving yards and TDs. In 2010, Ward became the first receiver in Steelers history and fifth in NFL history to reach 11,000 career receiving yards. In his first season in Pittsburgh (2007), Arians helped the Steelers rank third in the NFL in rushing (2,168 yards) and running back Willie Parker finished fourth in the league with 1,316 rushing yards that season and was selected to the Pro Bowl. MORE NFL COACHING CAREER: Prior to joining the Steelers, Arians spent three seasons (2001-2003) as offensive coordinator for the Cleveland Browns. In 2002 under his guidance, the Browns scored their most points (344) since 1987 and also improved in virtually every major offensive category. In his first of what would be two stints with the Colts, Arians spent 1998-2000 as the team’s quarterback coach, working under offensive coordinator Tom Moore. Arians tutored Peyton Manning in his first three seasons in the league and helped him earn Pro Bowl nods in his second and third seasons (1999-2000). In 2000, Manning set then team single-season records for passing yards (4,413), completions (357), 300-yard games (5), and touchdown passes (33). The 33 TD passes broke the mark established by Johnny Unitas in 1959. Arians first job in the NFL was with Kansas City as the team’s running backs coach for four seasons (1989-92). With the Chiefs, Arians tutored running back Christian Okoye, who was selected to two Pro Bowls (1989, 1991). Okoye led the league in both rushing attempts (370) and rushing yards (1,480) during the 1989 season and also rushed for 1,031 yards in 1991. Arians spent the ’96 season in New Orleans as the Saints tight ends coach. COLLEGE COACHING CAREER: Arians began his coaching career in 1975 as a graduate assistant at his alma mater and then was elevated to running backs coach. From 1978-80, he coached RBs and WRs at Mississippi State before moving within the SEC to Alabama where he worked under legendary coach Paul “Bear” Bryant. He coached Crimson Tide running backs for two seasons (1981-82) before becoming one of the youngest head coaches in Division I history when Temple University hired him in 1983 at the age of 30. He spent six seasons (1983-88) coaching the Owls but was let go following the 1988 season. Eight stops and two-plus decades later he became a head coach again when he earned the job in Arizona in 2013. PERSONAL: As a collegiate quarterback at Virginia Tech (1972-74) Arians was voted the team’s MVP as a senior. He finished his college career with 78 completions on 174 attempts for 1,270 yards, six touchdowns and eight interceptions in addition to rushing for 539 yards and 14 touchdowns on 135 carries. Arians set a school single-season record for rushing TDs by a QB with 11 in 1974. A native of Paterson, NJ, Arians grew up in York, PA where he met his wife, Christine. The couple has two children – son, Jake, and daughter, Kristi Anne – as well as a granddaughter, Presley and a grandson, Aiden.